A carefully devised and consistently executed garden services plan is the best way to protect the health, beauty, and vitality of your investment in professional landscaping services. It is important to keep your landscape clean and vibrant, because it makes a powerful statement to surrounding residences. It tells people you care about your property, and that you wish to emphasize its preeminence from every possible vantage point imaginable. It makes absolutely no sense whatsoever to invest in professional landscape design and then let your carefully designed and planted garden take a pounding from the vicissitudes of Houston weather and suffer from the agonies of neglect. The Houston climate is brutal, to say the least. Most of the plants in your garden come from other places in the world, and they are not used to the combination of heat, humidity, and inconsistent heavy rains. It is essential that you spend the money to protect them with a garden services plan that will give them the best chances of survival during both the hot dry months of summer and the temperamental cold snaps of Texas northers and chilly, wind-driven rains and sleet. It may surprise you to learn that garden services actually start with your lawn, not your garden. The typical Houston lawn should be trimmed once a week during the summer and twice a week during the winter. It also requires a professional landscaping service called lawn aeration—something many people do not even know about. Aeration prevents the clay-like Houston soil from clumping up around grass roots and blocking the vital flow of nutrients and water. Your lawn also needs to be fertilized once per quarter regardless of the season. Your garden services plan must also include professional tree maintenance. Each small tree in the yard requires pruning as often as recommended for its particular species. Your landscape services company should also schedule annual deep root fertilization as part of your garden services program. Shrubbery, hedgerows, yew tree lines, ground cover plants, and many vines require consistent pruning in order to maintain both vitality and the desired contour that they require to contribute to shaping the landscape. Flower beds need to be weeded weekly. Weekly bed weeding guarantees the volunteer plants won’t take hold and crowd your shrubs, ground covers and annuals. It is recommended as well that your landscape professional turn the mulch in the flower bed every two weeks. This will aerate the soil to allow for optimal air and water exchange around root systems. 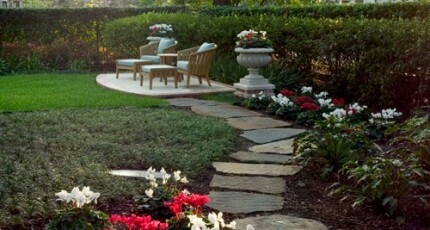 A garden services plan needs to also include fertilization and chemical treatments. Treating plants with fertilizer and insecticides is not as simple as simple as you may have been led to believe. Retail chemicals are not always safe to use with many of the more exotic plants we install in Houston gardens. In order to ensure that the treatments used to protect your plants from disease and insect infestations do not inadvertently harm them, it is best to have the company that installed your garden also treat it periodically. Make sure that your garden services plan includes freeze protection for your plants. If you are new to Houston, you may be inclined to think that that a place that is so hot is in the summer would be safe for plants year round. This is not the case. When Canadian cold fronts move through the Great Plains down to the Texas Gulf Coast, they can plummet temperatures below freezing in a matter of hours. Plants that were rained on the night before will be frozen by mid-morning on the day of the freeze. Plastic is not a good protection for your plants because it blocks light and water, and it will suffocate them if it is left for even just a few days. Instead, let your landscape professionals come to your yard and protect your garden with a special freeze cloth which allows light, oxygen, and liquid water to pass through its membrane. Garden designers who work at the top of their game, like Exterior Worlds, possess high levels of knowledge and discernment when it comes to design principles, plants and ecological systems. As specialists, we typically develop plans based are the two major subsets for garden designs: formal designs and natural designs. We also pay attention to the long-term aspect of our Houston landscape projects, including the costs and requirements of maintenance. How to create a native garden? What is garden design landscaping?